improving stakeholder participation and capacity building with the aim of supporting sustainable wetland management. The project will work on 'twinned' case study wetlands from Europe, Africa and South America. Management solutions will be worked out for these wetlands with the aim of supporting the achievement of the above objectives. Knowledge and experiences gained from these case studies will be summarized in general guidelines aiming to support achieving project objectives on global scale. The project also aims at supporting the global exchange of expertise on wetland management. Stakeholder participation, capacity building and expertise exchange will be supported by a series of stakeholder and 'twinning' workshops. The WETwin project is funded and implemented within the frame of the 7th Framework Programme of the European Union, which is the main EU programme for research and technological development for the period 2007-2013. The topic of 7th FP, where WETwin belongs to, is "River basin twinning initiatives as a tool to implement EU water initiatives" (Topic 6.2.1.2.2.). This topic envisages integrated water resources management research activities carried out on twinned catchments/river basins from Europe and catchments from international cooperation partners to underpin the implementation of Integrated Water Resources Management (IWRM) in these countries in compliance with EU Water Initiative (EUWI) objectives and Millennium Development Goals (MDG-s) targets. The impact expected from research projects funded under this topic is to support the EUWI in the context of international cooperation. Such collaborations will have to pay particular attention to constructive engagement with the entire spectrum of societal actors. Accrued emphasis has to be placed on communicating the research process and its results to all societal actors to make the research policy relevant and enhance its impact. Target areas for the 2007 call: Africa and South America. The EUWI is designed as a catalyst and a foundation on which future action can be built to contribute to meeting the MDG-s for drinking water and sanitation, within the context of an integrated approach to water resources management. 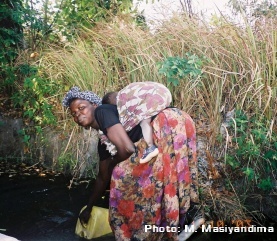 The referred MDG envisages to halve by 2015 the proportion of people who are unable to reach or afford safe drinking water and the proportion of people who do not have access to adequate sanitation. For more information about EUWI and MDG-s visit the following sites: www.euwi.net, www.un.org/millenniumgoals. Despite the international protection of the Ramsar Conventionand despite themultiple functions that wetlands provide for ecology and society, many wetlands in Africa andSouth America lack sustainable management and are being threatened. Several guidelines exist on sustainable (and wise) wetland management. Yet, these are insufficiently implemented. The reasons behind are to be assessed. Scientists a nd water stakeholder group operate too often as two separate communities. By working together, both scientific expertise and local knowledge can be harnessed to help tosolve complex waterproblems . Through the involvement ofstakeholders, science-based outcomes can be produced with direct benefits for the needs of society. O w nership of project results will largely benefit from strong stakeholder involvement and is a precondition for a sustainable impact. Wetlands are often crucial elements in river basins. Because of the multi-functional character of wetlands and their sensitivity towards changes in water allocation, nutrient loading and land-use developments within the entire river basin, wetlands should form an integrate d part of river basin ma nagement. Efficient and cost-effective nutrient reduction and water storage capacities of wetlands make it possible to utilize them for drinking water supply and sanitation all over the basin. At the current pace, the Millennium Development Goal s for adequate sanitation will be missed with half a billion people worldwide. It is expected that the increased incidence for droughts (climate change), increased water consumption and waste water production further increases the distance-to-target. 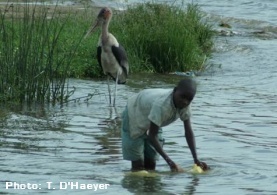 A river basin plan of adaptive actions is needed. Ecological functions and values of wetlands are crucial not just on local scale but also on basin-wide and global scales. 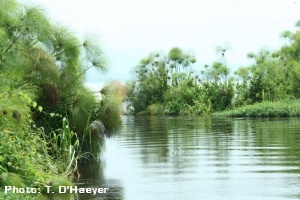 Preservation of wetlands thus plays a key role in the global protection of the biospher e.
Because of the potential conflicts and tradeoffs between the different ecological, livelihood, water treatment and water supply functions, wetland management needs to be based on a m ulti-criteria approach. The objectives of South-South cooperation are to enhance solidarity among developing countries and to allow to benefit from each others relevant strengths, experience and expertise. South-South cooperation i.e. between African partners and between Africa and South America, is limited. Traditionally, most existing is North-South cooperation. Alternatively, the acronym can be interpreted as WE-TWIN, indicating that Twinning is the core element of this project. According to the Call (ENV.2.1.2.2), the project is expected to support the implementation of the EU Water Initiative (EUWI) in the context of international cooperation. The main objective of the EUWI is to contribute to meeting the UN Millennium Development Goals (MDGs) for drinking water and sanitation, within the context of an integrated approach to water resources management. Halting and reversing the current loss of natural resources and biodiversity are envisaged as challenges that EUWI should cope with. 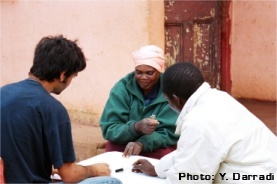 The EUWI is designed as a 'catalyst and a foundation on which action can be built to contribute to meeting the MDGs'. It is the explicit intention of the WETwin project to become such an action. As the Call also emphasizes, the WETwin project is expected to place particular attention on 'constructive engagement with the entire spectrum of societal actors' as well as on 'communicating the research process and its results to all societal actors to make the research policy relevant and enhance its impact'. The overall objective of the WETwin project is to enhance the role of wetlands in basin-scale integrated water resources management (IWRM), with the aim of improving the community service functions while conserving good ecological status. Identify community based technical and institutional solutions for the management of wetlands and river basins with the aim of utilizing the drinking water supply and sanitation potentials of wetlands for the benefit of people living in the basin. This concerns solutions for improving the relevant capacities of wetlands. Account for ecosystem functions and values of wetlands. The proposed management solutions should also take care of preserving (and also for improving as much as possible) the ecological values of wetlands. Identify strategies for adapting the management of wetlands to the changing environmental conditions. Identify solutions and strategies for integrating wetlands into river basin management and planning, by taking relevant national and international policies/guidelines into consideration, and also by accounting for the envisaged community service functions of wetlands. Ensure that stakeholders and decision makers will benefit from the project, also after the end of the project. Increase the exchange of expertise on wetland management and on IWRM; increase the transferability of results and achieve better international networking; enhancing North-South, South-North and South-South (Inter-African, African - South American) cooperation. Increase the capacity of relevant organisations to manage wetlands and river basins in an integrated way.